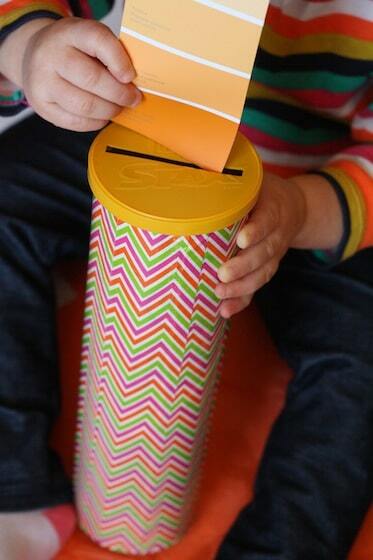 A pringles can and some paint swatches makes a great fine motor drop box activity for babies and toddlers! 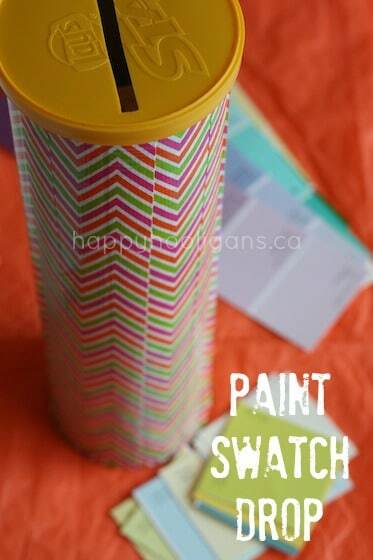 Yesterday, on my day off, I was sorting through my craft supplies and I decided to put a couple of Potato chip cans and a handful of paint swatches to good use by turning them into a fine motor activity for my toddlers. You don’t have to cover your potato chip can, especially if it’s like the blue one in the above photo, but the Pringles can was easy to cover, so I used one of my new favourite finds: Duck Tape. You can see how I used Duck Tape for another project recently when I made our Cardboard Drop Zone. I love this tape! 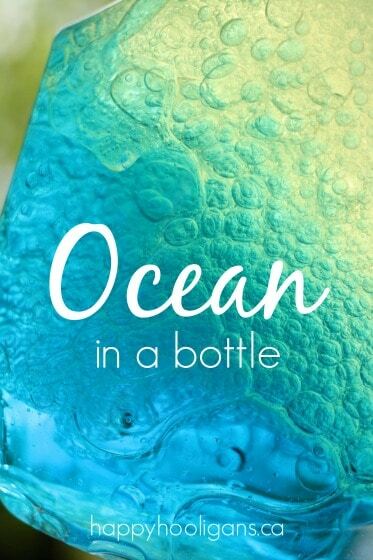 It comes in a wide variety of patterns and colours, and you can use it for so many things! 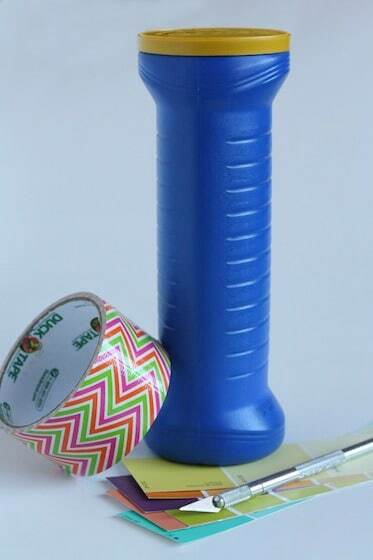 I covered my can by cutting long lengths of my tape, and running the strips top to bottom on the can. 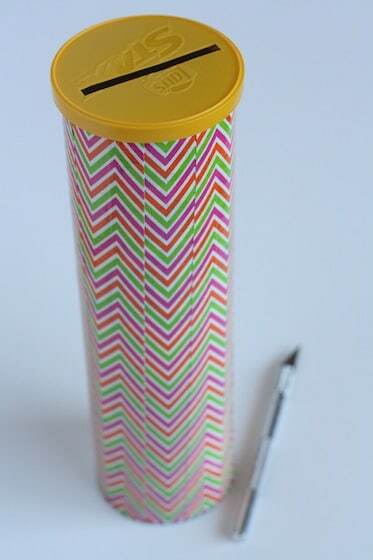 You could also use patterned paper to cover your can. In the lid of the can, with a craft knife, cut a slit slightly wider than your widest paint swatch. If you don’t have a cutting mat similar to the one pictured above, make sure to protect the surface that you’re working on. Your kitchen cutting board is a good alternative. Snap the lid on the can, and Voila! How easy was that? Now you just need some paint chip samples. You’re probably familiar with these. You can find them in any Paint and Wallpaper shop, and in the paint section of most hardware stores. For the longest time, I would just pocket a handful every time I saw a display. A lot of others do the same, but I always felt a little funny about it. I know the whole purpose of the paint swatch is for people to take them home, but I always felt like I was stealing them because, let’s face it, I wasn’t just taking 2 or 3. I was taking one of every fun colour I could find. My guilty conscience got the best of me one day, and I actually asked the owner of the paint store if they might be able to give me any swatches for “expired” colours. She explained that they don’t take paint colours out of circulation, and therefore the swatches don’t actually expire, but she opened up a cupboard and grabbed me about 20 packages of unopened swatches in colours that weren’t big sellers. She said they’d never go through them all, and she was happy to give them to me, knowing that we were crafting with them in my daycare. COOL eh? Goes to show you that it never hurts to ask! Okay! 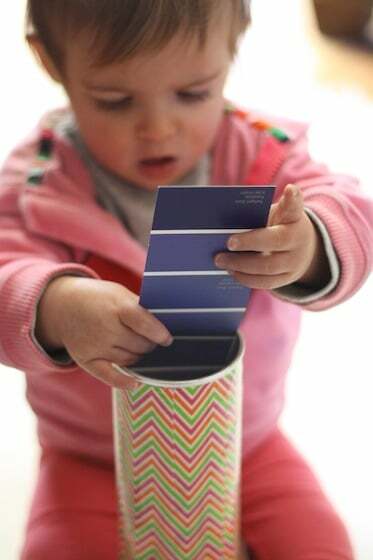 Once you have your swatches gathered up, hand the whole activity over to your toddler, and let them do their thing! and then dumping the paint chips out, to start all over again. The baby had a trouble getting the paint samples through the thin opening in the lid, so I removed the lid entirely for her, and she had a great time dropping the paint chips directly into the can. This was still a good exercise in fine motor for her. Those little paint chips are tricky to separate from each other, and challenging for little fingers to pick up off the floor. Hand-eye co-ordination is challenged as well, lining the paint sample up, and fitting it into the top of the can. 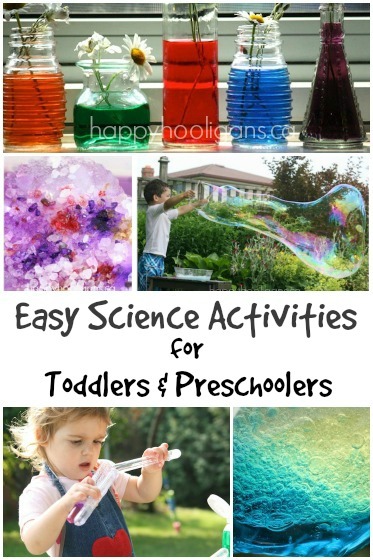 Don’t you love it when learning comes from the simplest of activities? Fun was had by all! 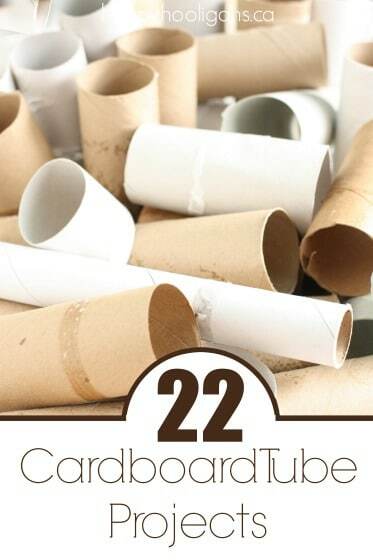 And when you’re finished, store the paint chips in the can for future use! So tell me, how have YOU used a Pringles can? If this is your first visit to Happy Hooligans, WELCOME! Be sure to pop over and Like us on Facebook! There’s always lots going on there. You can follow us on Pinterest as well! 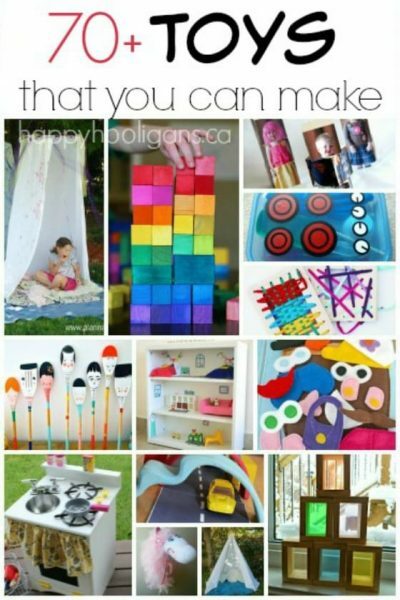 You’ll find over 80 boards filled with kid friendly crafts and activities as well as some boards that reflect my personal interests. What a brilliant idea. I love that you can also make it work for babies too. Great work. 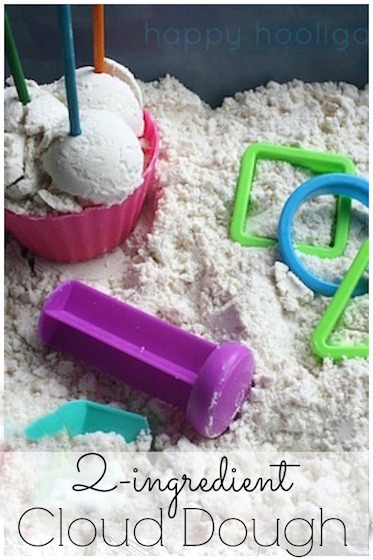 I did a similar thing with one if those tootsie roll banks and the little plastic things that come on pkgs of buns… worked great…kiddos loved it. Great idea, Nancy! There are so many possibilities, aren’t there? Thank you, Dominika! So glad you enjoyed it! I made Pringle tubes into mark making kits. I covered the tin in popualr themed paper eg Ben 10, Disney etc then added a strap so that it then looked rather like an holder for carrying arrows, put paper and pens in and left them outside. All our nursery children loved them and mark making increased. Wonderful, Anne! We may have to do something similar here! Love the versatility of the humble Pringles can! Hahaha! That had me laughing out loud, chalee8! A functional hoarder, exhibiting paint sample anxiety. Oh my. I think that probably describes a lot of us! I always grab a few of the paint chips too!! My new pile of craft/cutting pages…the travel brochures at the front of the hotel. 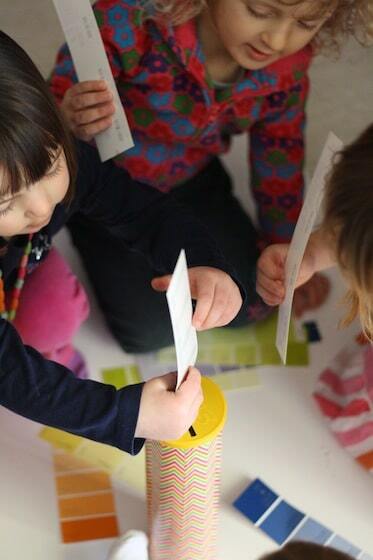 My littles love cutting and gluing and using them as maps. Love the idea of hotel brochures. We haven’t tried map-making here, but it sounds like fun! Love this pringles can make. It’s so good to be in the company of people who understand the need to save things like paint cards, pringles cans, etc. etc, etc. I’ve never seen the blue plastic holder shown on this page. Awesome idea! 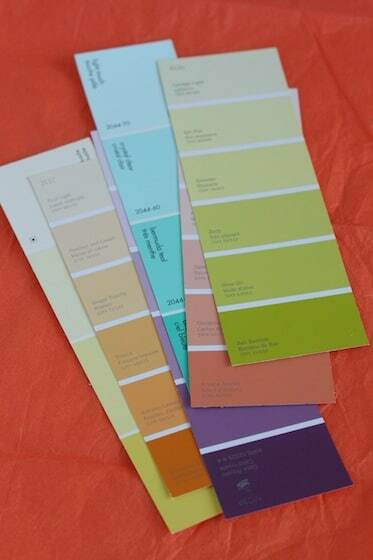 Will be heading out for paint samples today! My daughter loves doing stuff like this! This is similar but my mom got a wipe box one that was soft when you put your hand in it because some of them are hard! Anyway she cut up different fabric strips and my little loves taking them out and putting them back in! Thanks for sharing!